With the ever increasing popularity of salmon with Australian consumers, Huon Aquaculture has been working diligently to ensure that their product is better than the competition. This goal is achieved through a variety of measures such as the quality of feed, purity of the water in which the pens are located and also a close attention to the fish health and the prevention of parasites. It’s with this last goal in mind that Berserker has entered the Huon fleet where she will operate as a bath support vessel. The salmon are periodically transferred from their pens into a 76 metre well boat where they are given a wash that kills parasites. After washing the fish are transferred back into their pens. 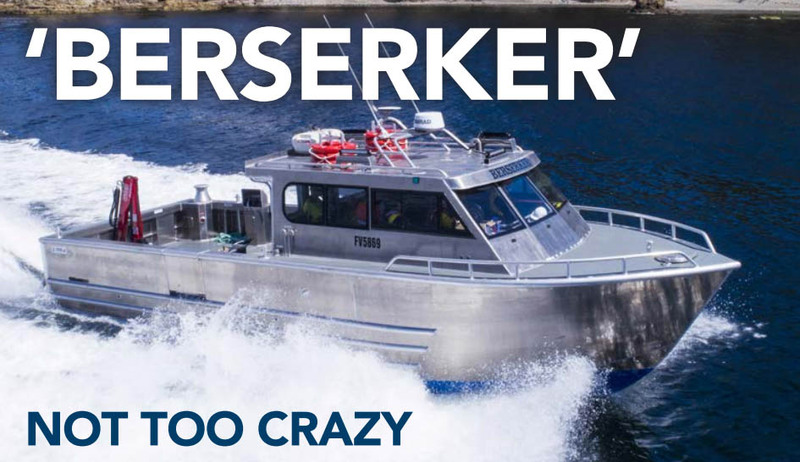 Berserker was designed by Oceantech of South Australia and joins a growing number of Oceantech designed vessels operating in the Tasmanian aquaculture industry. Built from aluminium by Haywards in Hobart, Berserker has an overall length of 12.9 metres, a beam of 3.97 metres and a draught of 70cms. Twin Cummins QSL9 diesel main engines provide the oomph with each engine producing 246kW @ 1,800rpm. The power is transferred via ZF 305-3 gearboxes with the port gearbox featuring a power-take-off. The ultimate receivers of the power are two HJ 322 waterjets from HamiltonJet which give Berserker a top speed of 25 knots. Having to work in close proximity to the pens and the mooring lines led to the selection of waterjets over props and the need for precision control= in all weather conditions sealed the deal as the blueARROW control system more than met the customer requirements. An external helm control station means that the skipper has direct communication with the two crew members, especially useful when working close to the pens. The aft work deck is quite spacious and is equipped with a Fassi M25AFM folding crane. Huon work 24 hours a day in all kinds of weather so safety was also an integral part of the design and plenty of deck lighting was needed to ensure crew safety. Because Huon works offshore quite a long way from their shore bases, both speed and comfort were considered as part of the design. The wheelhouse is equipped with two helm chairs as well as a settee and a compact galley. The forepeak is accessible through the cabin and is available for use as storage space.